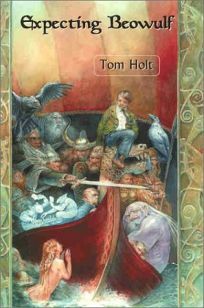 Novelist, Englishman and admittedly incompetent amateur blacksmith Tom Holt offers readers two previously published comic fantasies under one cover in Expecting Beowulf (with a bonus of a very funny bio: Holt identifies himself, for instance, as a ""short, fat, middle-aged bearded guy who sounds like someone doing a rather bad Hugh Grant impression""). A nighttime collision with the last of the Frost-Giants (who's disguised as a badger) shifts an ancient balance of power, and mild, dopey Malcolm Fisher is made ruler of the world in Expecting Someone Taller; in Who's Afraid of Beowulf (get it?) an archeologist rouses a dozen Vikings from a 12,000-year-old sleep and then has to be their treasurer, chauffeur and pseudo-mom as she aids them in their quest to save the world.